I’m back at my parents’ house for Christmas, and while I’m here I’m hoping to make a start on converting my Taig benchtop milling machine to CNC. It has been stored under a sheet of plastic in a damp shed since I moved out of my previous workshop about five years ago (crikey, has it really been that long?). Fortunately I smothered everything in oil at the time, so it hasn’t suffered too badly from rust – the worst bits are the handles, which I’ll be replacing with motors anyway. The oil has gone sticky and attracted a lot of dirt though, so my first task is going to be to completely dismantle, clean, oil, remantle (is that a word? if not, why not? ), and adjust everything to run smoothly and accurately again. I have a little job coming up where a manual precision drilling machine would be very useful so I’m planning to do the first stage quite soon. 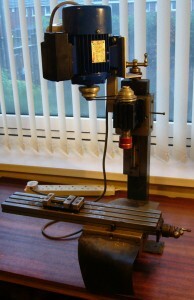 The thing on the spindle is a first generation HighTechSystems rapid tool changer. Unfortunately it’s now discontinued, though I already have a decent selection of holders for it and I think once I have converted my Taig lathe to CNC it shouldn’t be difficult to machine bespoke ones to hold different sizes of tool. The idea is you have a specific holder for each tool used in a job. You set up in advance a software table that tells the machine controller exactly how far each tool sticks out of its holder, so you don’t have to waste time re-zeroing it each time you change tools (which is a manual process but only takes a couple of seconds).